The last spring frost in your area is a good reference point when planning your garden. This is often referred to as the frost free date (FFD). This date is the reference point used in this planting guide. To find the last average frost free date (FFD) for your area follow this link. The page below is a pre made cheat sheet for finding the indoor seed sowing dates with most of the working out done for you. The vegetable are in order, starting with those with the longest seed to transplant time, and the first to sow, to the shortest. 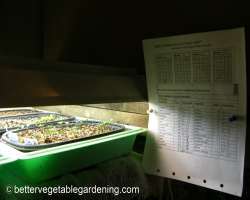 Click this link for a Printer Friendly Version that includes four 30 day calendars to help calculate and record the dates to start seeds.